This is a typical modern-style Youngs gastropub, with a drinking area at the front and an open kitchen and dining area at the rear. Apparently it also has a large garden. Young Ordinary & Porter, Wells Bombardier & Courage Best were the beers. Aspalls was the cider on tap. The clientele seemed a bit more upper class than at the Roebuck nearby. Service was fine. Had Sunday lunch here, was ok, veg was good but not enough meat. Dont visit if your a wine lover, took us til at least half way through the wine list to find something we liked and by then it was time to leave. 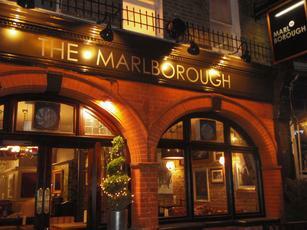 We had our office Christmas party at The Marlborough and have to say it was the best Christmas Do I have ever had. The staff were not only professional but extremely friendly and helpful. The food was so amazing we decided to book a table for their New Years Party. At first glance we thought it was a little pricy at �40 ph but any worries we might have had quickly disappeared. A pub to have a slow beer in to savour the leather sofas and the young-person-about-town atmosphere. Yes it is more expensive than some other places but that is what you expect, and want, in a place like this. 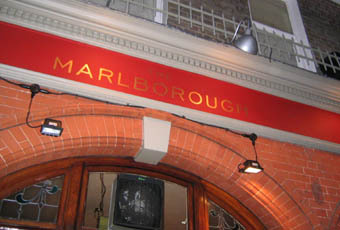 My husband and I just came back from The Marlborough, in Richmond, following what was probably one of the worst meals we have ever had! My husband enjoys having a roast dinner on a Sunday evening; however, he was extremely disappointed with the overall quality of his meal. Despite checking with the waitress about the freshness of the roast potatoes and Yorkshire pudding, these were appalling. The �roast potatoes� were in fact boiled new potatoes and the Yorkshire pudding was flat. The beef was chewy and the gravy poor. I ordered �The Works Burger�, which was served with stone cold French fries and the meat not only was extremely poor quality, but over cooked. For our toddler we ordered the mashed potatoes with sausages, which must have been made with instant mash mixture, for it was inedible. We used to eat at this pub very often a couple of years ago and were always very pleased not only with the service but the food. We believed they must have changed their chef and after a couple of very disappointing experiences we stopped going until earlier this year. As it seemed to have improved slightly it was at my suggestion that we decided to dine there again tonight, but after a terrible evening when the quality of the food was nothing but scandalous, I believe we will not be returning!